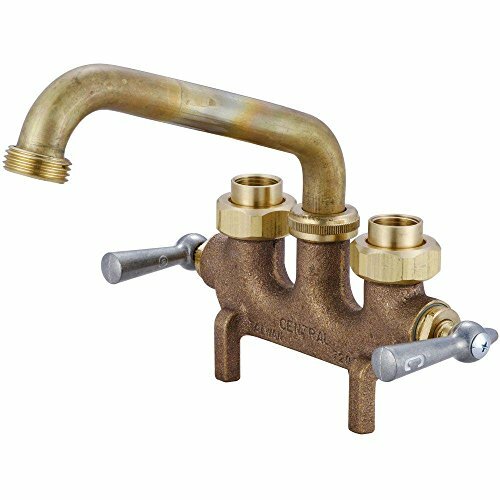 The laundry faucet has a cast brass body with straddle legs and female coupling union supply connections (also available with copper sweat union "c" suffix). the stems are all brass with a double O-ring seal and rubber seat washer. The 6-inch brass swivel spout has a hose end Adapter. The laundry faucet has a rough cast brass finish. 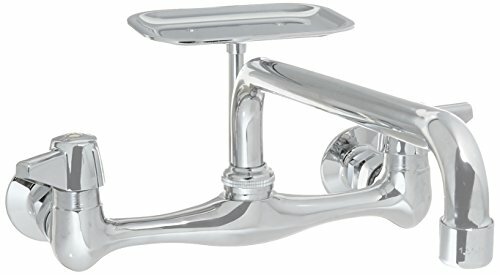 Two Handle Shelf Back Lavatory Faucet. Canopy Handles. Replaceable Seat. 3-Hole 4" to 6" Installation. Brass Pop-Up Drain Assembly. 2.0 GPM Flow Rate. The wall mounted sink fitting is designed with a solid cast brass body with replaceable seats. The flanges are all brass and have 1/2-inch female pipe connections. The inlet supply location is adjustable by rotating the flange to obtain a 1/4-inch center variation. The 12-inch spout has a water saving aerator that limits the flow. The stems are all brass with a double O-Ring seal and rubber seat washer. The canopy handles are zinc die cast with a chrome plated finish. The faucet and flanges are polished and copper, nickel, and chrome plated. The soap dish and post are brass with a chrome plated finish. 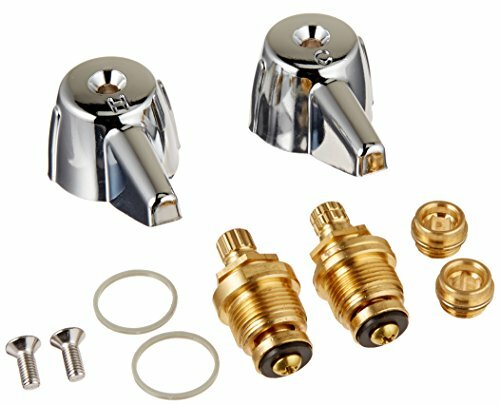 Return your tub or shower to "like new" condition with the Danco Central Brass Trim Kit. Repairing a leaky faucet is an inexpensive alternative to replacing the entire faucet fixture. This a remodeling kit includes all the parts you need to restore your 3-handle, metal shower fixture. The chrome finish complements your existing fixtures and helps freshen the appearance of your bathtub. The bubbler head is made from a brass forging. It is polished and copper, nickel and chrome plated. The bubbler comes with a brass flange that is also triple plated. The 1/2-14NSPM shank is included. The bubbler is activated by a chrome plated push button and has a replaceable cartridge assembly (K-361). The bubbler meets ASME A112. 18.1M and is ANSI/NSF 61/Section 9 Certified. The wall mounted sink fitting is designed with a solid cast brass body with replaceable seats. The flanges are all brass and have 1/2-inch female pipe connections. The inlet supply location is adjustable by rotating the flange to obtain a 1/4-inch center variation. The 6-inch spout has a water saving aerator that limits the flow. The stems are all brass, with a double O-Ring seal and rubber seat washer. The canopy handles are zinc die cast with a chrome plated finish. 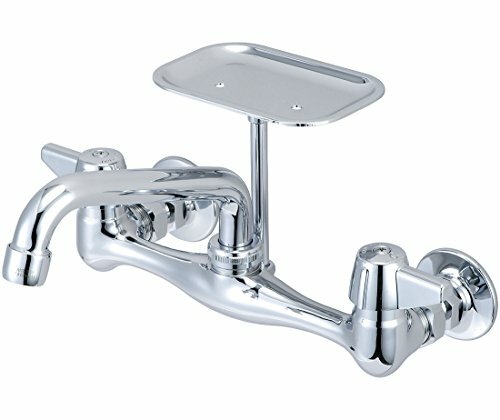 The faucet and flanges are polished and copper, nickel, and chrome plated. 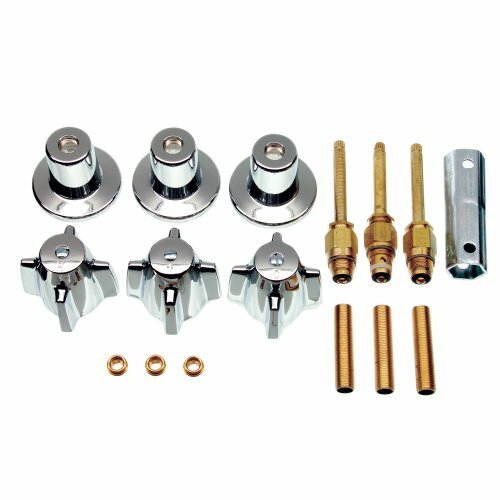 Repair and update your Fixtures with this DANCO Faucet Rebuild Kit for Central Brass Faucets . It is used to repair kitchen and bathroom sink faucets. The kit includes 2 faucet stems, 2 faucet seats and a pair of faucet handles. 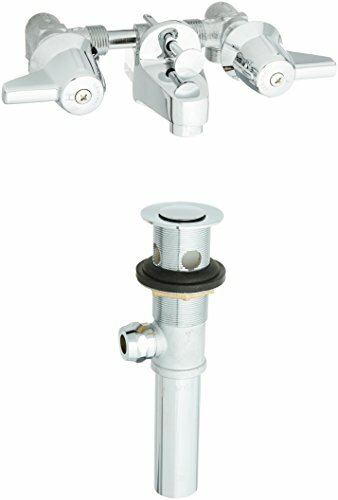 0477 Features: -Utility shower faucet.-3.5'' Centers.-Offset legs.-1.5'' Female coupling union connections.-The stems have a double O-Ring seal and rubber seat washer.-The 22.5'' shower riser is a galvanized steel pipe.-Flow Rate: 2.5 gpm at 80 psi.-ADA compliant.-ASME A112.18.1M listed. Construction: -Cast brass construction. 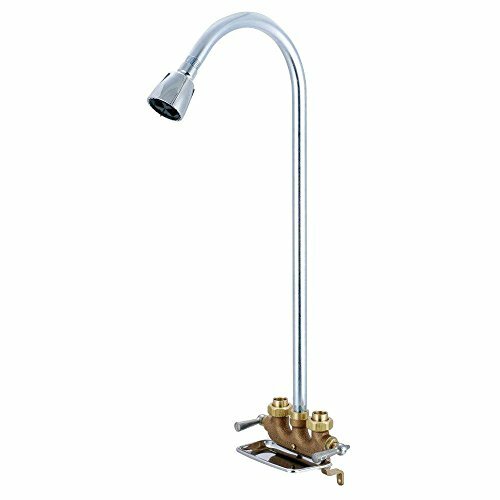 Dimensions: -Overall dimensions: 24'' H x 7.563'' W x 9.25'' D.
The wall mounted sink fitting is designed with a solid cast brass body with replaceable seats. The flanges are all brass and have 1/2-inch female pipe connections. The inlet supply location is adjustable by rotating the flange to obtain a 1/4-inch center variation. The 6-inch spout has a water saving aerator that limits the flow. The stems are all brass, with a double O-Ring seal and rubber seat washer. The canopy handles are zinc die cast with a chrome plated finish. The faucet and flanges are polished and copper, nickel, and chrome plated. The soap dish and post are brass with a chrome plated finish. 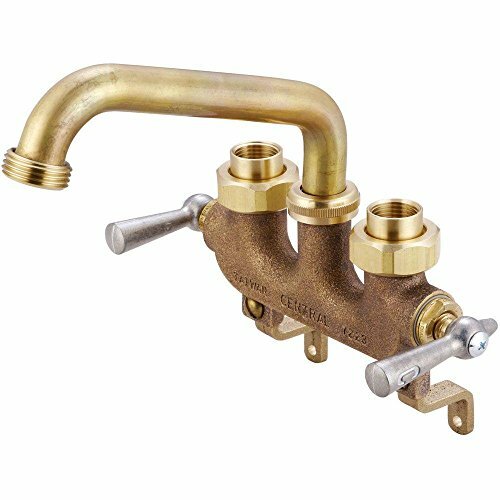 Looking for more Central Brass Faucet similar ideas? Try to explore these searches: Canon Pro Shooters Accessory Package, Ultimate Buffing Cloth, and Performance Router Processor. 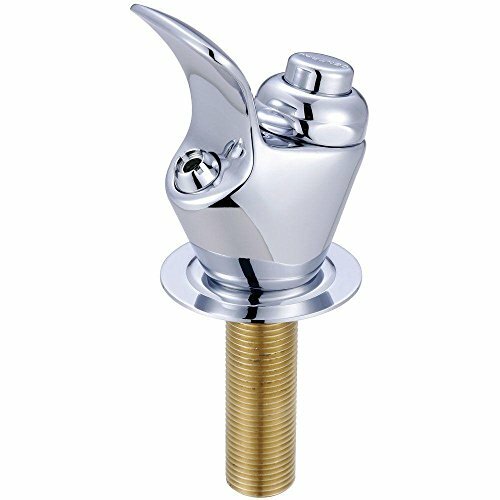 Shopwion.com is the smartest way for comparison shopping: compare prices from most trusted leading online stores for best Central Brass Faucet, Pacemaker Commercial Sink, Silver Button Covers, Brass Faucet Central . Don't miss this Central Brass Faucet today, April 25, 2019 deals, updated daily.